I found this mistletoe outside my great-uncle Peter’s home in Mutitjulu, the Aboriginal community at Uluru. 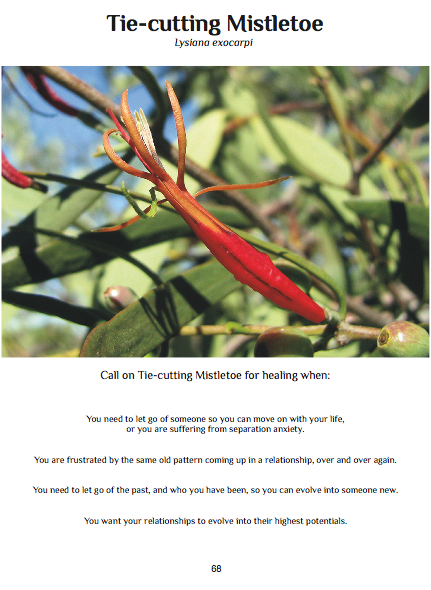 This mistletoe helps us let go of other people and move on with our lives. While this can include moving on after relationship break-ups and the death of loved ones, tie-cutting doesn’t necessarily bring about the end of a relationship. Quite often, it improves relationships, because tie-cutting removes the old rot in the space between people’s hearts. I cut ties with my father and my husband last year with the help of Mother Mary and Archangel Michael. Since then, my relationships with both men have been healthier and happier. This flower spirit also heals trauma associated with separation anxiety. Being forced to move on too quickly after loss can create wounds that cause clingy behaviour due to fear of loss. Besides cutting ties with people, we can also cut ties with our own outworn identities and behaviours. This spirit flower helped me by reaching into my solar plexus and grasping hold of a blockage I had stored in this part of my body. You are holding on to the past, clinging tight to old ideas about who you are. You need to let go and shed your old skin. Have faith in your capacity to evolve, even if you cannot clearly see where your next transformation will take you. Mistletoe showed me the grasping, fearful nature of the blocked part of myself and I really felt sorry for it, because it reflected a deep poverty of consciousness, like a pauper on the streets grabbing desperately at mouldy crumbs. I reached a hand out to this inner self and invited it into the warmth of my heart. I did this by creating images of bringing the pauper off the streets and giving her a good meal and some companionship. I imagined talking with this self about how it might re-invent itself by making use of its unique strengths. Cured of our road-hopping, we stayed put on the corrugations and limped into Tapatjatjaka on dusk. The journey had taken longer than we hoped, but we were determined to drive on and camp the night at Chambers Pillar, a place I remember visiting as a child with my grandparents. The road into Chambers Pillar wound around like a snake tying itself in knots, taking us through running streams and riverbeds, up and down large sandy dunes, then up the steep slope of a narrow ridge with a sharp 90-degree turn at the top, all in pitch blackness. It was a relief to arrive safely at camp, to say the least. This excerpt is from my book Wildflower Spirit Journey, which will be available in Jul 2015. If you would like to pre-order a copy, you can do so via Publishizer, or my main website. Contact me if you have questions!